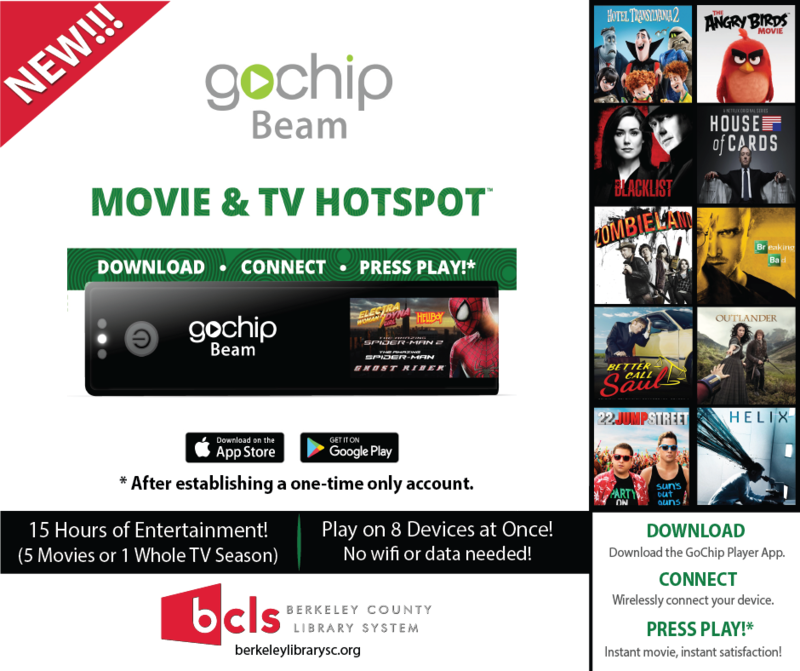 The Berkeley County Library System is excited to bring you a new way to enjoy on-the-go-entertainment with the new GoChipBeam. This movie and TV hotspot allows you to enjoy 15 hours of entertainment (5 movies or 1 whole television season) on one easy-to-use device. Plus you can play on 8 devices at the same time without using wifi or data! You simply download the app, wirelessly connect your device, and press play for instant access. Check out a GoChip Beam from our catalog here. GoChip Beam is your ticket to mobile entertainment—movies and TV shows on-the-go, wherever you go—even without internet. Visit gochip.com/apps on your smartphone, tablet or PC to download the app, then create an account and log in. Press and hold the power button for 3 seconds until the right light turns solid green. On your mobile device, open Settings > Wi-Fi to connect to the GoChip Beam (see the label on your Beam for network name and password), then wait for an indication that your device is connected. Please note: when you connect to your Beam, your device may let you know that you are no longer connected to the Internet. This is expected behavior because you are now connected to the Beam and not to the Internet—giving you access to all your movies & TV shows from the GoChip—without Internet access, streaming or downloading. Start the GoChip app and enjoy your movie or TV show. You can connect up to 8 devices at the same: each person playing what they want when they want. It’s truly magic! You provide the popcorn, we provide the fun. Press and hold the power button for 3 seconds until the right green light turns off.